This isn't my first time making gemstone flowers. 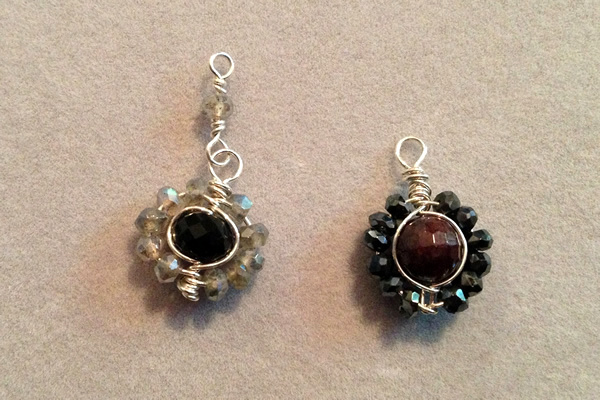 I've also made a gemstone flower ring and two different pairs of earrings with gemstone flowers: earrings 1 and earrings 2. And while I was looking for those - I realized I also made a flower gemstone pendant! I guess we could say that I enjoy making gemstone flowers! The funny thing is that when I look at all of these flowers, each one uses a slightly different technique. In any event, here are yesterday's flowers - which are not quite in their end state - since I haven't decided if they will be pendants, connectors or earrings yet. The picture below uses some fabulous faceted dark blue lapis lazuli rondelles surrounded with coated labradorite rondelles. The coated labradorite is similar to having an AB coating on glass beads - it just enhances the flash of the bead - and makes it more white than blue. The beads are ultra-sparkly. I think I was hoping these two would be for earrings, but they are slightly different lengths and I'm not sure there is anything I can do about that (except compensate with the ear wires?). I also made a gemstone flower using a faceted black onyx center with the same coated labradorite beads and one that uses a rounder center bead of faceted opaque red garnet. It looks a bit like a low grade ruby in this picture - but it is garnet. It is surrounded by hematite rondelles. All of the flowers use a technique that is based on the herringbone weave. 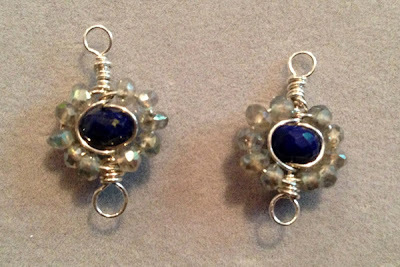 The first wrap around the stone is used to frame the stone and the second holds the beads. Ending the wires is a little tricky though - and on the two flowers above - you may not be able to tell that I folded the base wire up behind the flower to hold the wraps in place and end the flower neatly. It is less of a problem with the ones that have the wrap loop finish - like in the first picture. 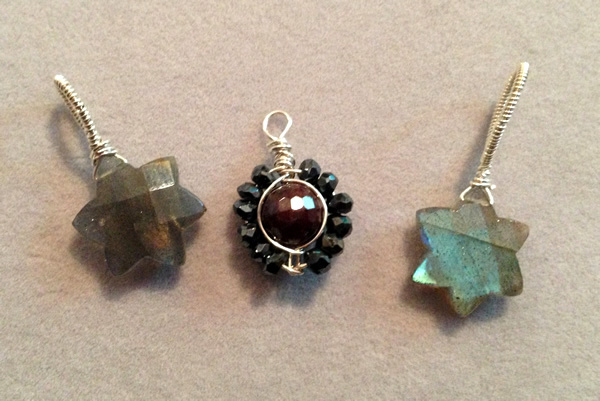 I also have these lovely faceted Star of David made of labradorite. They have great flash and I want to be able to list them on my Etsy store. I decided they would look best with a simple coiled loop that is large enough to slip on any chain. 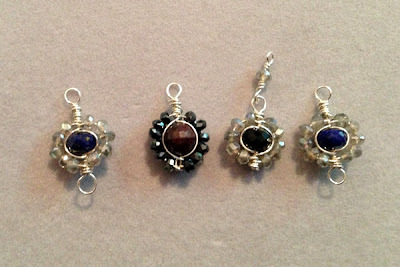 I am thinking of adding a gemstone beaded chain - but I'm still not sure. I think the wrapped loop on the one on the right is a little too large - but since I don't know how I'll use it yet - it seems like it would be a waste to re-do it prematurely. It may just work out. Lisa, they are so sweet and the labrodorite has beautiful flash! Thanks Jackie! The flowers are slowly revealing what they are meant to be - and surprisingly - it isn't earrings! I'm hoping to have those projects done and posted this weekend.